Gavin Ma & Co is an independent CPA practice providing specialist Self Managed Superannuation Fund services to SMSF trustees, financial planners, investment advisers and stockbrokers. Gavin Ma & Co is independently owned and has strong relationship with accountants, financial planners, stockbroking firms and SMSF administrators. We charge a fixed and all inclusive fee based on our outsourcing agreement. 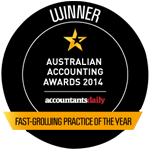 Our fees are competitive and lower than most of traditional accounting firms.